Gridy is a responsive, magazine photography and gallery style Blogger blog Template and having a simple and clean look with great features likes Seo Friendly and Grid style. 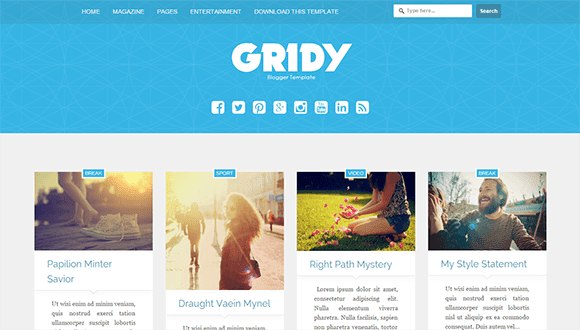 Gridy is equipped with various of widgets which will help you to publish your blog more professionally. To make it easy for you we have published this detailed documentation, so that you can setup your blog correctly. You have made a good decision by choosing our template. You can check the live demo or download the template through the button below and also Please Read this documentation carefully in order to set up your blog and please note that there’s no support for free users. Change the Cress arugula peanut tigernut wattle seed kombu parsnip. Lotus root mung bean arugula tigernut horseradish endive yarrow gourd. Radicchio cress avocado garlic quandong collard greens., with text. Change the perPage: 7, with your number of posts.